This year’s Joomla & Beyond conference is being held in Cologne, Germany, 10th-13th May. 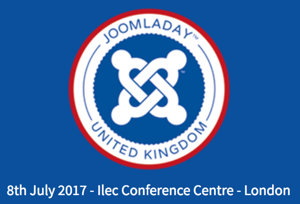 This year’s UK Joomla Day is on 8th July at the Ilec Conference Centre, in west London. There’s a varied programme of talks on topics such as the new custom fields in Joomla, Joomla & SEO, and a chance to sit the new Joomla! administrator certification exam. So, if you’re a Joomla! designer or developer, a Joomla! webmaster or own a Joomla! website, there’s plenty of good stuff on offer. These days are also a great opportunity to meet other Joomlers and take part in the wider Joomla! community. Perhaps we can meet up if you’re going?